You are here: Home / Blog / Make This Simple Peter Pan Shadow Costume from Scraps! 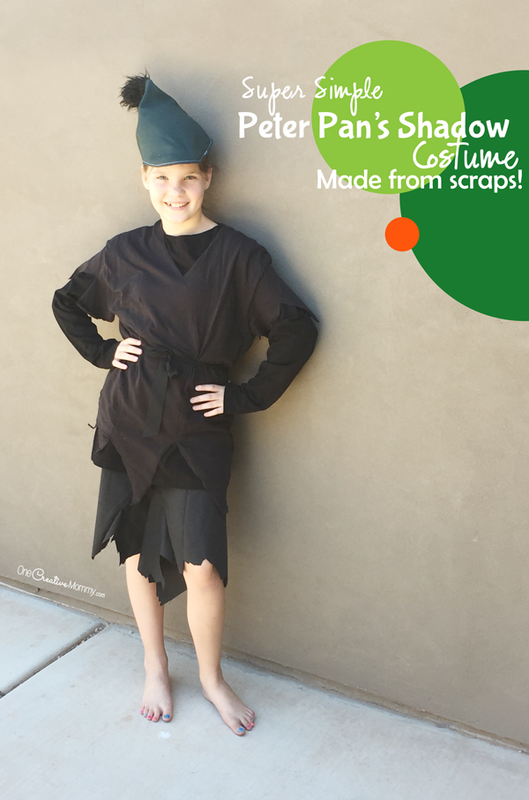 Make This Simple Peter Pan Shadow Costume from Scraps! I don’t know how we lived in the same place for ten years without discovering 4H summer camps, but our summers will never be the same! Boo and Lu enrolled in sewing camps, and they made the most amazing things! In addition to some really fantastic projects, Boo’s camp actually challenged them to make Halloween costumes from scraps. Boo came up with this amazingly creative Peter Pan Shadow costume. Isn’t it the coolest? Boo came away from the camp with several professional-looking projects, but this one–created by her–is definitely my favorite. Of course, you can make it, too, so I’m sharing it here. I’ll give you the general idea of how to get this look, and you can adapt it yourself using what you have at home. The tunic is probably the easiest part. Grab a black t-shirt that is too big and cut out a v-neckline (if the shirt doesn’t already have one). Now make large triangular cuts in the sleeves and along the bottom to give a rugged look. Use a black fabric scrap to tie the tunic at the waist. Boo added a long-sleeved black t-shirt under the tunic to make herself look more like a shadow. Depending on the temperature where you trick-or-treat, you could wear or not wear the extra shirt. Boo actually created these using a simple elastic waistband pants pattern, but you could easily grab a pair of cheap black pants at a thrift store and fringe them in the same way you fringed the tunic. I couldn’t believe it when Boo told me how she made the hat. It’s made from the sleeve of a suit coat! She cut the sleeve off of the coat right at the shoulder. She used the piece from near the shoulder and sewed a dart in it to to make the right shape for her hat. She added a black pom pom at the end, hemmed the raw edges, and she was done! What do you think? Could you make a costume out of fabric scraps? Her friend made a Peter Pan costume in the exact same way. What a great idea! I made Bear’s Indian costume from t-shirts, too. I love cutting up t-shirts to make something new! Not up to making your own costume this year? Try some of these from Amazon. These are affiliate links. You get the same low price, but I earn a little bit when you buy. Thank you! Check out more cool costumes below. The images are linked to posts, so click on them. What a great looking Peter Pan costume, I absolutely love the fact it has been made from scraps as well! Completely pocket friendly. Thanks, Sarah. I’m all about things being pocket friendly! Store bought Halloween costumes have gotten so pricey! Thanks, Anosa. Not everyone has the knack for DIY, but not all of us are great world travelers like you either! I’d be scared to do half the things you do. This is a great costume idea! I once made a fairy costume out of fabric scraps but I did rely pretty heavily on some foundational clothing pieces I already owned. This Peter Pan Shadow one looks so great! Thanks, Nellwyn. I think that’s what DIY is all about. You take what you already have and turn it into something better. 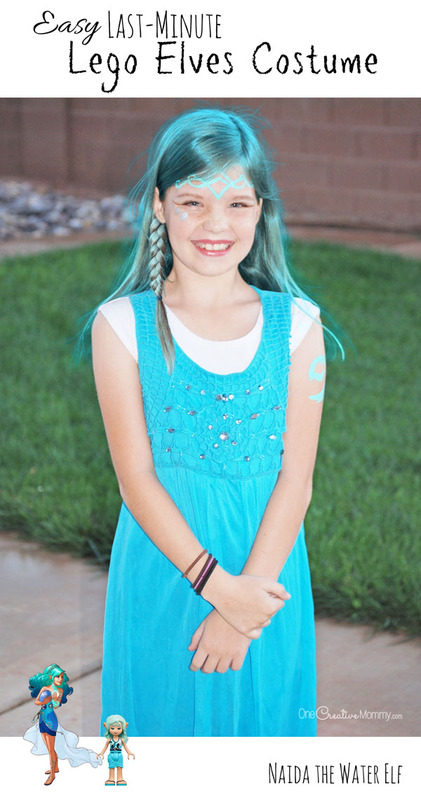 I love diy costumes, especially ones that are easy to do! This is a cute costume for someone wanting to dress as Peter Pan! Thanks, Jen. I know my daughter had a lot of fun creating this costume. I love Peter Pan! Such a great movie and a cool book! I think the shadow is a great costume idea! Have someone else dressed up as Peter Pan so that the team is completed! Thanks, Corinne & Kirsty. 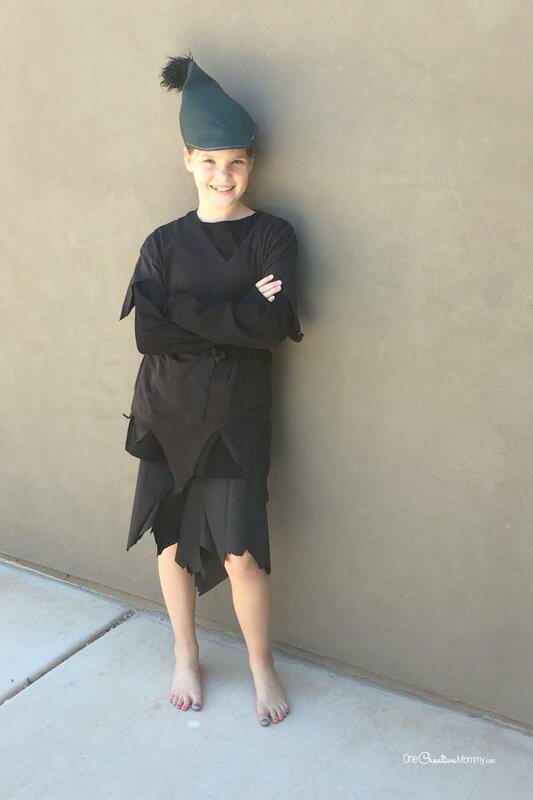 My daughter’s friend made a Peter Pan costume, so their costumes did go together. Thanks, Dawn. My daughter is the creative one. She came up with the costume herself. Thanks, Pan. I hope you and your hubby had fun dressing up as Star Wars characters! These are all great costume ideas. I love the spider buns. I will have to try it in my hair this year. Thanks, Claudia. Did you try the spider buns? I hope you had a nice Halloween. This is the cutest costume and so simple! What a great idea. And I love that spider hair too. Thanks, Amber. My daughter had a lot of fun with the costume. So cool. I’m watching Once again now, and just finished the Peter Pan sezon. You guys did a great job with this costume. Thanks, Cristina. My girls are watching Once right now, too. This is fantastic. My kids would enjoy helping me out making that costume. Thanks, Sarah. I hope you and your kids had a fun Halloween! Thanks, Muideen. My daughter had a lot of fun with the costume. This is so creative! I’m indeed impressed by how you managed to make fancy costumes totally out of scraps. Thanks for this interesting post! Thanks, Linh. My daughter is the creative one. She made this costume from scraps in a sewing class. I like seeing what do-it-yourself people can do with scraps. The Peter Pan costume is a winner! Thanks, Rachel. My daughter had a lot of fun creating this costume. It is a cool costume and I loved that you made it from scraps. I think it’s great. I should have done more with that when my daughter was younger. So much you can do with scraps. Thanks, David. It is amazing what can be done with scraps. Handmaking things is what I am all about. That is a very cute idea! Thanks, Angela. I love making things from scratch, too. Absolutely genious! I love how it turned out and I love love love that it’s from scraps! Perfect recycling craft project! Thanks, Akamatra. My daughter had a lot of fun creating the costume. I like these beautiful idea! The costume is cute and fun, and affordable! Who wouldn’t love that? Thanks, Hannah. I love costumes that don’t cost much money. Don’t you? This is awesome. I bet it was a lot of fun to be able to create their own costume! So much more adorable and cost effective than purchasing one from the store. Thanks, Anne. It was really fun for my daughter to create her own costume. I can’t wait to see what she comes up with next year. 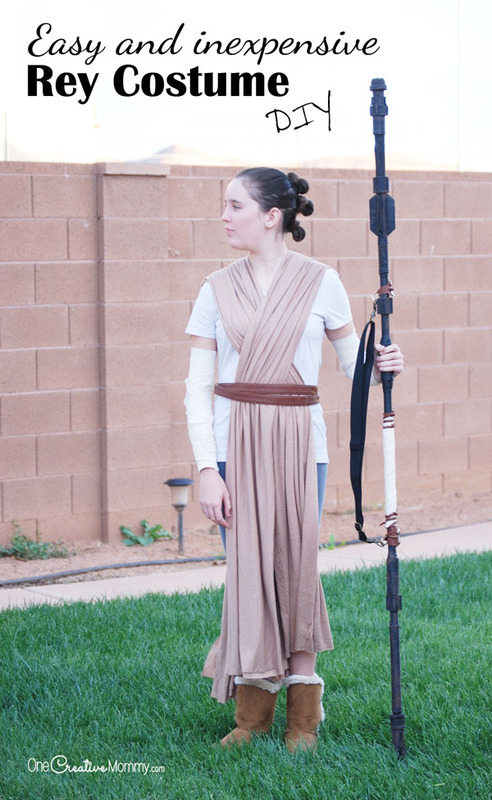 Wow this is cool costume, easy and cost efficient :) I need to make my costumes too! Thanks, Blair. Making costumes is really fun if you have the time. Adore those spider hair pieces. Are they clips? Did you make them or buy them? Thanks, Michelle. 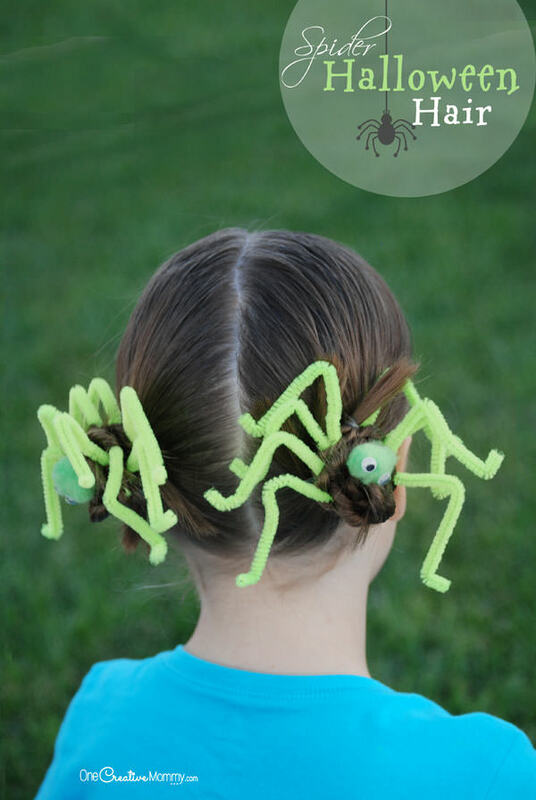 The spider hair is created from pipe cleaners. Just click on the image in the post to visit the tutorial. Thanks, Tali. Good luck with your five costumes! I hope you finished them in time. Thanks, Emman. Can you believe that hat was made from a suit coat sleeve? Hands down for this idea, I love Peter Pan! I am really getting an urge to make this today but already in the middle of making pillow. I will make it and share it with you. Thank you so so much for this post and i will subscribe to your blog to get more posts like this in my inbox. Thanks, Hannah. How did your pillow turn out?